Vietnamese Banh Mi sandwiches have an endless variety of options for fillings. 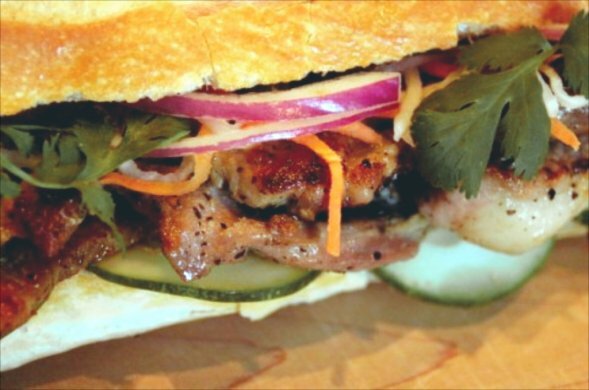 This black pepper pork banh mi recipe is one common type that can be found in many banh mi shops. This filling is often called “grilled pork” banh mi. 1-2 tablespoons fresh ground black pepper. If you like the spice and flavor, add more! 1. Mix all marinade ingredients (except for pork) in a plastic bag. Let all ingredients dissolve in oil, then add slices of pork. Allow everything to marinade for at least 1 hour. 2. Heat up frying pan, lay slices of pork, one layer at a time. When one side is cooked, flip to other side to finish cooking. 3. Assemble pork in your sandwich with condiments. Log in | 54 queries. 0.599 seconds.